Easily grown in average, medium moisture, well-drained soils in full sun to part shade. Prefers consistently moist soils, but will tolerate short periods of drought. Will naturalize in the landscape by self-seeding. May be propagated by seed or cuttings. Phytolacca americana, commonly known as pokeweed, common poke or scoke, is a vigorous, herbaceous perennial that typically grows to 4-10’ tall with a spread to 3-5’ wide. This plant features (a) showy reddish-purple stems, (b) large, alternate, lanceolate green leaves (each 5-10” long spreading to 2-4” wide) which exude an unpleasant (some say fetid) aroma when bruised, (c) apetalous, bisexual, summer flowers (to 3/4” wide) which bloom July to September in slender racemes to 8” long, each flower composed of five showy petal-like greenish-white sepals, 10 stamens and a pistil composed of united carpels, (d) grape-like fruits (each to 1/ 4” across) which emerge green but mature to a deep reddish-purple, and (e) very large taproots which will grow to 12” long and 4” thick. Pokeweed is native to clearings, fields, pastures, open woods, thickets and roadsides in eastern North America from Quebec, Ontario and Minnesota south to Florida, Texas and northern Mexico. Notwithstanding its somewhat attractive ornamental features, pokeweed is generally considered to be an invasive weed in many areas. Moreover, all parts of this plant (mature leaves, fruits and roots) are poisonous to humans, with the only exception being its young spring shoots and leaves (must be boiled in at least two changes of water) which have historically been prepared as a popular vegetable green primarily in parts of the southeastern U.S. Some nurseries refuse to sell this plant because of its toxic properties. Flower racemes are typically erect when in bloom but begin to droop as the fruit develops. Berries typically appear about 30 days after the flowers bloom. 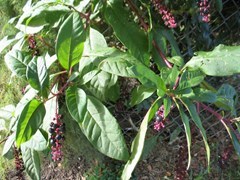 As this pokeweed continues to bloom from mid-summer to fall, it will begin to simultaneously display flowers and fruits in various stages of development. Genus name comes from the Greek word phyton meaning plant and lacca meaning crimson lake in reference to the deep reddish-purple fruits. Specific epithet is in obvious reference to this plant being native to America. Common name of poke is a contraction of puccoon or pocan or poughkone (from an Algonquin Indian name for this plant). Berries were once used to make ink, hence the sometimes used common name of inkberry. An additional common name for this plant is poke sallet (local term meaning salad). No known serious insect or disease problems. Susceptible to mosaic virus. This plant may be grown in native plant areas, but think twice before growing it in the garden because of its poisonous qualities and weedy habit.